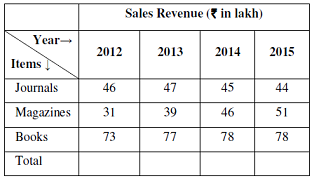 The table below embodies data on the sales revenue (in lakh) generated by a publishing house during the years 2012-15 while selling books, magazines and journals as three categories of items. Answer questions 1-3 based on the data contained in the table. 2. In 2015, approximately what percent of total revenue came from books? 4. Approximately, what proportion of good students are male? 5. How many female students are excellent? 6. What proportion of female students are good? 7. Which of the following correctly lists computer memory types from highest to lowest speed? 8. Which of the following statement(s) is/are TRUE? To convert Hexadecimal number to Decimal number, multiply every digit with 16 power of digit location. Then, sum all the multipliers. In fact, we do not need to multiply the fraction again, because we had 0 as the fractional part of our result there. Hence the representation of .625 = .101 (base 2). Copyright is a legal right created by the law of a country that grants the author of an original work exclusive right for its use and distribution. This means whatever content the author created cannot be used or published by anyone else without the consent of the author.